In honor of its tenth anniversary online, the Cartographers’ Guild ran a project to map a large, collaborative world. Each participant contributed a map of one country, done in whatever style they chose and with whatever lore they chose. Some of us compared notes with our neighbors to negotiate trade routes and such. Here is my contribution, the Maucland Confederacy! I am quite pleased with this pen-and-watercolor-pencil map. The colors came out richly, the overall theme holds together nicely, I was able to experiment with some more map elements than I have previously, and I completed the whole project end-to-end in a month, which makes it my second-fastest map after Abrantoc! You can see the development of the project in my Cartographers’ Guild work-in-progress thread here. Be sure to check out some of the other wonderful maps in this forum! Hey, Americans. I want you to know that I’m looking for a few things from my national leadership, especially the President. Infrastructure investment. Doing this is how we will solve a huge number of problems: Want to create jobs? Advance American science and technology? Mitigate global warming? Fix broken bridges? Make the electric grid more robust to cyberattack? Then we have to invest in our highways, power systems, public transit, National Science Foundation, NASA, and data systems. This all takes concerted national effort and a lot of money, but the important thing about it being an investment is that the payoff is greater than the cost! A considered, logical, and data-based approach to solving our pressing problems. Issues like income inequality, racism, campaign finance reform, education, the national debt, immigration, foreign policy – or anything else, really – cannot be solved with a simplistically soundbyte-y ideologies like “build a wall,” “create jobs,” or “bomb them.” They are complex, multifaceted problems, and we know from history, science, or economics which solutions are more likely to work and which are not. We should use that knowledge. To give an example, if we want to reduce the incidence of gun deaths, studies show that the most effective way to do so is to reduce the rate of gun ownership. To give another, global warming is definitely a thing, definitely caused by humans, and definitely going to threaten our lives and livelihoods in the future: we should fix it, and we know how. In some way, a reduced role for ideology may help advance the other two points, too. It would be nice to see more of these perspectives from the campaign trail. None of the Republicans have any interest in any of my points. Most of them actually seem to take opposite positions; to listen to their debates, I guess America needs less investment, more war, and more ideology. On the Democratic side, Hillary Clinton seems to be interested in items 1 and 3, while Bernie Sanders seems to like them all. If only Congress had more adherents to these ideas! I take commissions! And I would be willing to sell some existing original pieces. (Really! It’s not all spacecraft engineering with me.) Got a fantasy novel, RPG, or just a private world you want depicted in hand-drawn style? I’ve uploaded several more maps for you to purchase as prints on Imagekind, including the latest Gliese 581g, as well as two maps not yet featured here, Abrantoc and Erthal Province Frontier! I finished a big new map! You can purchase a print here. The world known to humankind as Zarmina (catalog identifier Gliese 581g) is a habitable planet orbiting a red dwarf star. It is tidally locked to its dim sun, such that one face of the planet always points toward the sun. The most striking consequence of this orbit geometry is that the habitable region of the planet is a disk-shaped area roughly the size of an earthly continent. The center of this zone always sees a sun at high noon, while toward the edge of the disk, the sun sinks gradually away from zenith. Outside this region, Zarmina is encased in ice. As the sun does not define east and west, the cardinal direction convention on Zarmina refers to the planet’s orbit, instead: prograde (in the direction of the orbit), retrograde, normal (up from the orbit), and antinormal. Zarmina does not exhibit evidence of plate tectonics. Surface features express several processes: large-scale rift graben form from tidal stresses, shield volcanoes build over mantle hotspots, impact craters and basins dot the planet, and erosion slowly whittles down the more ancient features. The world hosts life with biodiversity similar to the Earth. One dominant intelligent species has settled across the landmass, with cultures reaching technological development levels roughly equivalent to 1300-1600 CE on Earth. There are three regions with large populations, indicated on the map in normal-retrograde (NR), antinormal-prograde (AP), and normal-prograde (NP) callouts. In the four major language families of Zarmina, the natives call their world Hámnù, Pedak, Gaustan, or Estivama. The NR region hosts two major linguistic and cultural families. The first is an empire ruled from the city of Hòmp Sīnkà (Port Sinka). Explorers and artisans populate this empire; though the political extent of the empire only reaches as far as Níngtòhús (Greencliff), speakers of the imperial language can be found all along the coast in the prograde direction as well as in coastal settlements on the other side of Fíkùm Pòst (The Normal-Direction Sea). The antinormal borders of the empire are more ragged and contentious, however – the imperial urge to spread its vision of culture and knowledge brings it into direct conflict with the city-states in that area. The people of Kivod Sev Adoso (Mountain Gate Town) dominate the substantial resources of Sev Skem (Mountain Channel) and have repelled several campaigns launched from Hútpòkā (Chasmtop). Hòmp Sīnkà rapidly loses its stomach for these campaigns, and so Kivod Sev Adoso holds back imperial expansion. A more fluid and contentious collision of cultures occurs in Pasken Gimet (Pasken Forest). Scattered settlements under the command of local chiefs raid imperial populations farming antinormal of Ngùsì Āmā (Wide River) while imperial reprisals prevent the Pasken peoples from incorporating large towns. The disparate kindgoms of Ogjapud (Grayrock), Katofa Petang (Retrograde City), and Fetva Zand (Calm Peninsula) maintain their own set of animosities and alliances. The plains of the AP region offer little shelter from the winds that blow in off the ocean. As the land rises, larger and larger plants cover the land until one encounters lush prairies between dendritic river networks. Roaming clans live on the prairie “kidan.” A few large settlements dot the kidan, most notably Jung a Uid Nakaun (the City of Two Rivers). The kida clans take pride in not pinning themselves to a particular place – many of their dwellings are portable, and they happily move their crops to new locations on the fertile plains when they tire of the old. The culture is leery of townfolk. The Ushtin clan is a splinter from the kida clans, and is more attached to their resource-rich homeland on the shore of Gaiju a Shai (Lake of Wind). On the other end of the cultural spectrum, the dramatically different Togui a Awaish (Chasm of the Forest) hosts a sect worshipping the sun god Dautwai. This sect possesses the settlements of Santiso (roughly, Above-the-Green) and Uigonja (named for the uigon trees), as well as a major urban center in Jung Togunau. From the isthmus of the Nakau Dautwai, dramatic views of the Audos a No (Mountain of the Sun) have inspired monuments throughout the city. The natural defenses of Togui a Awaish shield the people within from raiding kida clansmen. Lush lands and geographic barriers squeezed into a comparatively smaller area give rise to the warring city-states of the NP region. Though they share a common linguistic root, each of the population centers here represent separate nations. The largest are Evinbok and Neka Estag, both named for their original monarchs. Evinbok holds a position of strategic strength, with access to productive outlying farmland in Pantma Zhusti (the Upper Plains), while timber and easily quarried rock are in the ancient impact basin of Gesta Kazi (Broken Bowl). Kagzai (roughly, Blue-ton) and Ka Topi (Lower Town) are notable for practicing a form of representative democracy. Ka Shata Besi (High Cliff Town) is the center of a prosperous small nation of traders, who build ships from the timber of Tifa ko Pantma Shti (Forest of the Red Plain) and sail through Vimna Shti (Red Pass) as far antinormal as Sot Ushtin. This map is hand-drawn with Pigma Micron pens of various types, then colored in Derwent watercolor pencils. I finish the map by painting over the pencils to blend and soften the watercolors together. The last step is photographing the piece with a 60 mm macro lens. The entire thing is 17″ wide and 14″ tall. “The Martian:” Yeah, Martian dust storms are nothing. Yeah, Rich Purnell could’ve explained his maneuver to the NASA top brass with about six acronyms and the phrase “gravity assist.” Yeah, real-life-JPL has almost nothing to do with human space exploration. And yeah, that blow-up-the-Hermes thing is a completely harebrained and terrible idea. “The Martian” highlights what NASA must do, but is not doing, in order to get people to Mars. NASA must build interplanetary transfer craft optimized for deep-space travel, like the Hermes, not single-use capsules designed mostly for reentering Earth’s atmosphere like Orion. NASA must invest significant research and development effort into “in-situ resource utilization,” such as the robotic manufacture of the fuels and propellants the MAV uses for Mars ascent. NASA must develop closed-loop life support systems, like Mark Watney has in the water reclaimer and the oxygenator. NASA must learn to grow food on Mars, instead of trying to send every supply with their astronauts in a single mission. NASA must build vehicles that provide their crew with artificial gravity, by rotating, to counteract the bone loss effects of long-duration spaceflight. NASA must learn to let its astronauts solve their own problems when they are twenty light-minutes away from Mission Control. Most of all, NASA must try a lot of ideas, and they must be willing to see some of those ideas fail, in order to accomplish their ultimate goals. Right now, NASA’s plans for getting people to Mars revolve around a series of activities designed to “learn how to live and work in space.” These activities include astronaut Scott Kelly’s hashtag-YearInSpace mission and the Asteroid Redirect Mission. Commander Kelly’s mission has the goal of learning how the human body responds to a long duration spaceflight. At the end of his mission, Kelly will be tied for the fifth-longest duration spaceflight. We already have much experience with long spaceflights. Our friends in Russia have even more. So we already know pretty much everything that’s going to happen to him. What’s more, we know ways to mitigate those adverse effects. We need, for example, something to simulate gravity. Like a spacecraft with a centrifuge. That’s a solution science fiction – including “The Martian” – has taken for granted for decades, though NASA has no obvious plans to build true long-duration space vehicles for its crews. They will go to Mars floating in the cramped zero-g environs of an Orion capsule. NASA also isn’t looking seriously at growing food to keep their crews fed in space. At a conference last March, I learned that all the Mars exploration reference missions involve taking all the food the crew needs for their entire travel, exploration, and return mission. That takes a huge amount of payload mass. Mark Watney did a much better job – and saved a lot of weight – by turning a few potatoes into food for a year. He got fresh vegetables, something his colleagues on the Hermes didn’t even have. Rover data shows that plants could grow on Mars, and creating a spacefaring civilization obviously depends on our ability to feed astronauts – so, again, why not look at the obvious solutions? The big idea that “The Martian” demonstrates is human ingenuity and problem-solving. To NASA, though, that’s a problem. NASA doesn’t want astronauts tearing components apart and putting them back together like Mark Watney does. They want to have astronauts follow a checklist that has been tested, verified, and validated on the ground in several dozen ways. That philosophy is so pervasive in NASA that agency officials talk about how they need the Asteroid Redirect Mission to “test” solar-electric propulsion – a technology that NASA itself has been using in flight missions since 1998. If NASA really wants to go to Mars, it’s going to have to learn to be more like “The Martian:” being willing to take risks, try new ideas, and give its astronauts leeway to make decisions. That’s what drives me nuts about “The Martian.” It depicts the space program that I’ve been hungering for for thirty years…and I’m afraid I won’t see such a thing for thirty more, at least. I have been enjoying “The Expanse” series by James Corey. It’s a space opera set a couple hundred years from now, after humans have colonized and populated the moon, Mars, the asteroid belt, and outer planet moons. Spaceships journey between these worlds, complex engineering projects remake asteroids into habitable stations, and space navies boost from place to place to fight space pirates. I think it’s great because it captures what I wish for humanity’s future: that we will go out and colonize other worlds, that we will be able to undertake engineering projects for the greater good, and that we will become robust enough to weather grand challenges – things we see in the world today as global warming, income inequality, nuclear proliferation, and the like. In many ways, the first three books are about the tension between such grand visions and idealism, and politics and profiteering. The books are soon going to be a TV series, and I am very much looking forward to see its depiction of space and space travel. (With the exception of parts of the first book, wherein Corey tried to write something horror-ish by being as gross as he could think to be. Whatever. Those are not the good parts of the book.) Corey steered clear of many sci-fi tropes that would have a big impact on the appearance of the series – no artificial gravity here! – and he made sure to build aspects of spacecraft engineering and operations into the cultures he depicted. For example, “Belters” nod and shrug with whole-arm gestures, so that they can be seen when wearing a suit. A good chunk of the books take place in zero gravity. Hopefully that will translate to the screen! Corey very quickly establishes that the powerhouse of his whole solar-system-wide civilization is the “Epstein Drive,” which is some kind of fusion engine for boosting spaceships around. It allows craft to thrust continuously from one planet or asteroid to another, accelerating constantly for half the trip and then decelerating constantly for the second half. This trajectory allows relatively quick travel times between worlds. Conveniently for crew health, and for TV production, the engine also provides “thrust gravity” inside the spaceship. Ships are therefore designed with decks in “stacks” above the engine with a ladder or lift giving crew access between decks, like in a skyscraper. A fusion engine isn’t a crazy idea, especially not for a civilization a couple hundred years in the future. The problem is propellant. No matter how powerful or efficient your engine is, you will always need to be chucking propellant out the back to sustain this kind of thrust profile. Picture this: you’re sitting in the middle of a frozen pond. The ice is perfectly frictionless, so you can’t walk or crawl or anything to get back to solid ground. What you do have is a bag full of baseballs. If you throw a baseball away from you, then you have given it some amount of momentum (mass times velocity). Your body gets an equal and opposite amount of momentum: you start sliding in the direction opposite your throw, but much more slowly than the baseball (because its mass is small while yours is big). Great! You have a way to get to shore. But you don’t want to wait out this long slide, so you throw another baseball. This speeds you up a little. Another throw speeds you up a little more. You can keep throwing baseballs until you decide that you’re going fast enough that you can wait it out. That’s basically how spacecraft work now: they thrust for a little, and then coast for a long period of time until they get to their next destination. But what if you wanted to keep thrusting the whole time? You will need more baseballs. Lots more baseballs. You are going to have to keep throwing them, constantly, to keep accelerating yourself. Writing that a spaceship has a fusion drive instead of a chemical rocket is like replacing yourself in this analogy with a major league baseball pitcher. They will put more momentum into each pitch, and so they’ll go faster across the ice. In other words, their thrust is more efficient. But they will still run out of baseballs at some point, and then they must coast without thrust. The spaceship must stop its burn, cease thrust gravity, and wait several more months before getting to their destination. In the end, high thrust – and, with it, appreciable thrust gravity – should only be active for a short time in any space voyage through the Expanse. As we are learning with ion propulsion nowadays, it can often be most efficient to run at a low level of thrust, but sustain that for a very long time. But that doesn’t give our characters a convenient floor to stand on! So Corey put the word “Epstein” in front of “fusion drive.” “Epstein,” in this case, is short for “magic.” It’s a kind of magic that lets Corey have thrust without propellant, so that he can simultaneously achieve short (astronomically speaking) travel times and keep his crew in thrust gravity. For a more physically realistic depiction of relationship between fuel, propellant, and thrust, consider Neal Stevenson’s spaceship Ymir in Seveneves. In the Expanse universe, spaceships are flipping around all the time to vector their engines in the correct direction to change their velocity. And we often read references to what the thrusters are doing on ships. This is all good. But the ships don’t really move the way real spacecraft move. First of all, orbits barely enter the picture. One scene in Leviathan Wakes involves a character plotting out the likely trajectories of a certain ship, but other than that, the characters can go just about anywhere they want to go as long as they have a good ship to call theirs. Absent the Epstein “magic,” that behavior isn’t really plausible. Second, though, is that Corey imagines his spaceships rotate themselves around in the same way just about all science fiction authors do: with thrusters. That’s not what most modern spacecraft do! They actually use wheels. Spin a wheel clockwise, and Newton’s third law kicks in: there’s an equal and opposite reaction. The spacecraft spins counterclockwise. Devices that function as I just described are, therefore, called reaction wheels. Other wheel-based devices that take advantage of gyroscopic torques can give satellites quite a lot of agility – without using any propellant. I suspect that the reason why these realistic actuators don’t often appear in science fiction is that there are no obvious cues to their operation: no thruster spurts, no blue glows shining out of emitters, nothing. The ship just starts to rotate. I was happy to read that Corey’s spaceships are all native to space. There are not many cases where a ship lands, and in those cases, it’s always a small one. The heroes’ ship does once, on Ganymede. With surface gravity comparable to Earth’s moon, that’s not such a stretch for a fusion-drive starship. 28 June 15 Edit: Darn it, I just started Cibola Burn and about the fourth thing that happens is that the Rocinante lands on an Earth-size planet and immediately takes off again. Minus points for that! Space combat plays a big role in the plot of the Expanse books. And it’s a generally great depiction of space combat! Lots of the tactics and technologies are grounded in plausible physics. Ships shoot missiles and guns at each other, the effective range of a torpedo is determined by how close your ship needs to be to make sure the enemy ship doesn’t have time to shoot your torpedo down, the crew all gets into space suits at the beginning of the battle, there’s a ton of electronic warfare activity, and the battles wax and wane in intensity as the spaceships maneuver and orbit. I’ve long thought that the most effective weapons in a space battle would be simple kinetic slugs or flak shells. My reasoning is simple: the speeds of objects in space are fast enough that a relatively small piece of junk can easily blast a hole through sensitive components. This is exactly why present-day spacecraft engineers – like me – worry about micrometeoroid strikes, space debris, and the Kessler syndrome. In the Expanse, the ships all fire torpedoes or guns at each other. And the results of weapon strikes are devastating: it only takes one torpedo or a few well-placed railgun slugs to take out a ship. Ships blast electronic garble at each other to screw up their targeting systems, but in the end the best defense is not getting hit – so we see the pilot do a lot of evasive maneuvering. I think this is all on the right track from a physics standpoint, though a real space battle with “Expanse-style” ships would probably take a lot longer, involve more orbit dynamics, and require a lot more computerized coordination. There are two rather implausible elements to the battles. First is the Epstein Drive, which makes the combatants’ maneuvering matter a lot more than orbit dynamics. Second is the “juice,” a drug cocktail that keeps people alive and functioning when exposed to high gee forces. As a way to deal with high gees, the “juice” is just about as good a science-fictiony way to do it as any other, including immersing people in fluid as in The Forever War or inventing some kind of mythological inertial dampener. In the end, though, humans are squishy, precious cargo, and fighting full-on battles with them inside your spaceships doesn’t make a whole lot of sense. 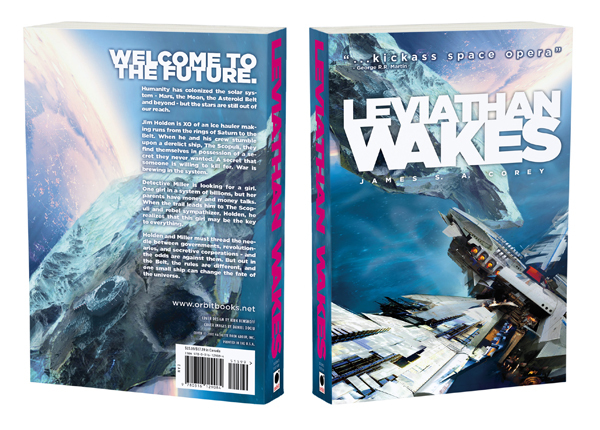 A plot point early on in the first book, Leviathan Wakes, revolves around the appearance of a stealth spaceship. This doesn’t involve any cloaking devices like in the Star Trek universe. 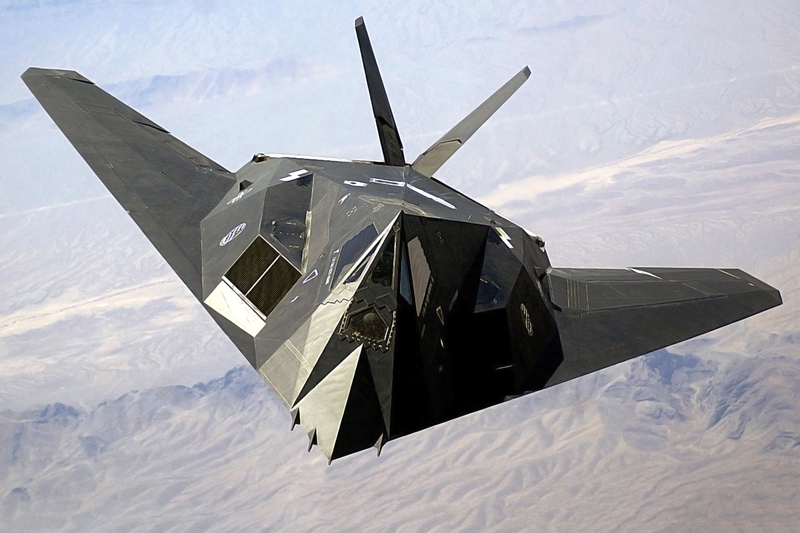 Rather, a few spaceships avoid detection by (1) being painted black, which hides them in the visible spectrum, (2) having surfaces that absorb or scatter radar, which hides them in radio wavelengths, and (3) radiating heat out the side of the ship facing away from the enemy, which hides them in infrared. Much as it might give some people heartburn, this is all fairly plausible! The first two points are easy to imagine based on what we know about about the present-day Air Force. Though its not as familiar to the general public, the third item is actually something that comes up all the time in spacecraft design: especially if your satellite has sensitive electronics – like an infrared telescope – the design will include coolers, heaters, baffles, insulation, and radiators designed to emit heat in directions pointing both away from the precious detectors and away from the sun. Even the International Space Station has radiators that rotate to keep them pointing away from the sun most of the time. (The reason is that if the radiators face the sun, they’ll start to absorb heat into the station instead of emitting it out!) Such a “thermal management system” could be designed to, with the other stealth elements, give one side of a spacecraft the appearance of a cool, black spot indistinguishable from the rest of empty space. A stealth spaceship wouldn’t be easy to build, and it wouldn’t be perfectly invisible – just harder to detect than normal to a lone adversary. And, in fact, both those points are relevant to the spaceships in the Expanse. One crewmember is able to spot a stealth ship on his sensors, but he doesn’t know what it is or how to respond to it. And that’s really all it takes for the stealth ship to accomplish its mission, after all! The very difficulty of constructing a stealth spacecraft actually makes the stealthiness more effective. The characters who cannot conceive that somebody could field a stealth spaceship end up more prone to falling prey to it. Spaceship stealth makes an appearance other times, as well. At least twice in the series, the heroes’ ship hides itself by masquerading as something it’s not. Lots of space stations in the Expanse, including some embedded in asteroids, spin to provide their inhabitants with centrifugal “gravity.” This is an idea that’s been around the aerospace and science fiction communities for decades, and Corey executes it well. In fact, one of the things I enjoy about the books is how the plot moves between the different environments of planetary gravity, low lunar gravity, spin gravity, and (“Epstein”-based though it may be) thrust gravity. The different gravitational environments contribute to different cultures, and they put the characters in interesting and different situations. If the TV series sticks to the books, we’re going to see low-gee gunfights and damage control teams solving problems in microgravity. Regularly. Anyway, suffice it to say that spin gravity is a strange environment and Corey, like most science fiction writers, doesn’t go into all the details. But spin is the right idea for giving gravity to spacefarers, and I can’t wait to see how the visual effects team on the Expanse interprets all the spinning structures. All in all, I’m thinking that The Expanse will be good for science fiction on TV. It will be a show with a time period a bit closer to us than, say, Star Trek. And the show will have a wide diversity of environments to challenge the characters. I am looking forward to seeing their depictions of spacecraft and how they move around in space! This week, NASA announced the selection of nine instruments for a proposed mission to Europa. Europa is probably the best place we know about to find alien life, and the discovery of alien life would surely be an achievement rivaling the moon landing in NASA – and human – history. I have an issue with the thinking presented by NASA in its press releases, though. Agency spokespeople say things indicating that the purpose of the Europa mission is to determine whether or not Europa “could be habitable.” The exact phrase on the web site linked to above is that this mission is part of “our search for oases that could support life” (emphasis mine). That’s not what I want from a mission to Europa. Probes to outer planets come decades apart, so I want to get as much done in a single shot as possible. What I want is to determine whether or not there is life on Europa. The important difference between those two statements – determine whether Europa could support life and determine whether Europa has life – betrays a slight difference in ambition. I want the big-risk, big-reward activities and objectives of a true moonshot. NASA is hedging its statements, and lowering the bar of its mission goals. I don’t want to do those things. I want to find out if there is life on Europa; similarly I want to find out if there is (or was) life on Mars, and I want people to live and work in space. Ironic that a space program – of all things – would lack ambition, isn’t it? You might think that this is just the public relations spin. NASA is trying to manage expectations, so that they know they can achieve the first objectives of any mission and claim success immediately. Then they can parade that success in front of Congress, while the scientists go after their real scientific objectives in the “extended mission.” But I think the underlying philosophy here is penetrating beyond the publicity level into the actual mission design. It’s easy to find statements from scientists, engineers, and NASA spokespeople that Curiosity couldn’t actually find life on Mars unless that life walked in front of its camera and waved hello. To me, those statements beg the question: why not? We sent a nuclear-powered jetpack-landed laser-toting robot all the way to Mars, why wouldn’t we put some instruments on it that can identify basic things like amino acids? Similarly: NASA sends a probe to Jupiter approximately once per decade (and slowing). Since that rate keeps dropping as time passes, why wouldn’t we try to answer the big questions as soon as we can? The great thing about opening up the ambitions of our space program is that it would enable engineers to implement known solutions to the problems we face in space. For example: we know that humans have health problems after spending long periods of time in microgravity. Do we need to keep answering the question of whether or not humans have health problems after spending long periods of time in microgravity? Or can we instead think about the details of building spacecraft that spin to provide artificial gravity? Similarly, we know that there are extreme logistical challenges in sending people to Mars. Do we think about long a mission we could run given the amount of food we can send up with our astronauts, or can we think about the details of having them grow food on Mars? It’s also the difference between the space program we have, and the space program we imagine. We Can’t Grow Forever – so What?